Texas Republicans in top races, led by U.S. Sen. Ted Cruz and Gov. Greg Abbott, are running ahead of their Democratic challengers, according to the latest University of Texas/Texas Tribune Poll. 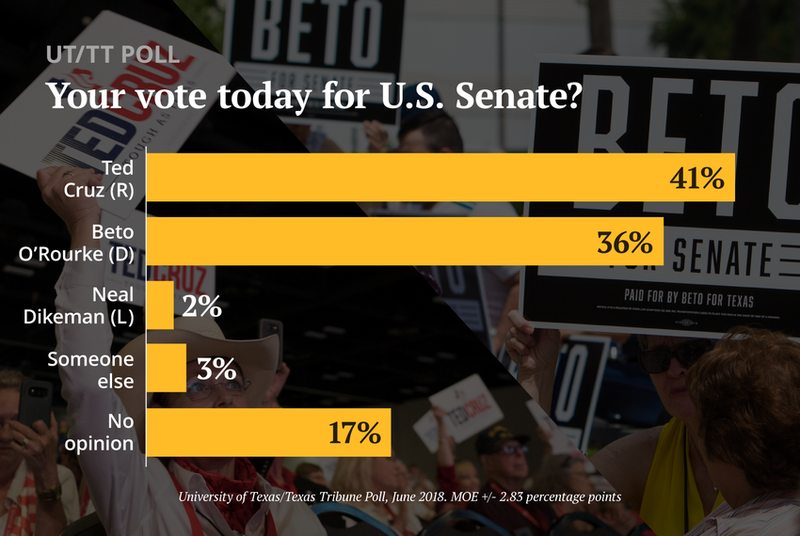 Republican Ted Cruz leads Democrat Beto O'Rourke 41 percent to 36 percent in the general election race for a Texas seat in the U.S. Senate, according to the latest University of Texas/Texas Tribune Poll. In the governor’s race, Republican incumbent Greg Abbott holds a comfortable 12-percentage-point lead over Democratic challenger Lupe Valdez — the exact same advantage he held over Democrat Wendy Davis in an early-summer poll in 2014. Abbott went on to win that race by 20 percentage points. In this survey, Abbott had the support of 44 percent of those polled to Valdez’s 32 percent. Libertarian Mark Tippetts had the support of 4 percent of registered voters, while 20 percent chose “someone else” or said they haven’t made a choice yet. “The safest spot for someone running in a general election in 2018 is to be able to rely on your in-state advantages without running afoul of the national environment,” said Jim Henson, director of the Texas Politics Project at the University of Texas at Austin and co-director of the UT/TT Poll. “Abbott has been able to do that. He took center stage in the aftermath of the Santa Fe school shooting that avoided alienating conservatives while taking a leadership role with other Texans." “It’s not like he’s made a big sale to Democrats, but Republicans have stayed with him. And he’s not having to elbow his way onto the stage like some of the officials lower in the executive branch,” Henson said. Henson said Patrick and other down-ballot incumbents work in the shadow of the governor, especially when the Legislature is not in in session. "That said, he’s still solid with the Republican base, though he lags behind Abbott and Cruz in both prominence and popularity," he said. "There’s nothing unusual about that." "If you’ve heard anything about Ken Paxton in the last four years, more than likely you’ve heard about his legal troubles," said Josh Blank, manager of polling and research at UT’s Texas Politics Project. Henson added a note of caution to that: "There’s also no erosion in Ken Paxton support by the Republican base. This reflects some stirrings amongst the Democrats and Paxton’s troubles. But it would premature to draw drastic conclusions for November based upon these numbers from June." Compare that with Congress, an institution getting approving grades from just 18 percent of voters and disapproving ones from 59 percent. At the state level, Abbott is getting high regard from registered voters at the moment, with 47 percent saying they approve of the job he’s doing and 36 percent disapproving. Patrick got about as many positive as negative marks, as did Cruz. But U.S. Sen. John Cornyn, who’s not on this year’s ballot, had approving grades from 27 percent of voters and disapproving grades from 38 percent. One characteristic of this year’s race for U.S. Senate is that Cruz, the incumbent, is well known and O’Rourke, the challenger and a U.S. Representative from El Paso, has some catching up to do. Cruz is less well liked: 41 percent of the voters said they have a favorable impression of him, while 42 percent said they have a unfavorable one. In O’Rourke’s case, 37 percent said they have favorable impressions, while 24 percent said they have unfavorable opinions. The non-answers — voters with neutral or no opinions — tell the tale: They account for 17 percent of voters in Cruz’s case and 40 percent in O’Rourke’s. In the other ballot-top race, 48 percent of registered voters have a favorable opinion of Abbott while 35 percent have unfavorable views. Valdez gets favorable rankings from 30 percent, unfavorable ones from 25 percent. As with her fellow Democrat, O’Rourke, a large number of voters — 44 percent in her case — have neither a favorable nor an unfavorable impression of her. The major parties don’t fare as well as their standard-bearers, largely because of the partisans who oppose each of them. Texas Democrats get favorable marks from 37 percent of registered voters and negative ones from 48 percent. Texas Republicans get positive marks from 35 percent and negative ones from 49 percent.